Roger Bennett and Michael Davies discuss football. And wear blazers. Usually at the same time. 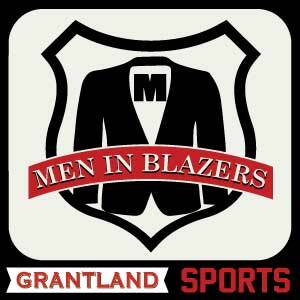 The Men in Blazers are driven by the belief that soccer is America's sport of the future. As it has been since 1972. Rog and Davo welcome back the Premier League with 10 questions, and talk with their World Cup hero Mexico manager Miguel Herrera. Rog and Davo travel to Portland for a special MLS All-Star Week show. Guests include DeAndre Yedlin, Alex Morgan and Clint Dempsey. Rog and Davo discuss European clubs' American summer tours and transfer window winners and losers. Plus, an interview with Man City and NYCFC CEO Ferran Soriano. Rog and Davo, back from Rio, reflect upon Germany's triumph, elect their Men of the Tournament, and reminisce on their personal highlights from Brazil 2014. Rog and Davo mourn England's insipid campaign, discuss the end of Spain's reign, marvel at the Von Trapps' win, and ask if soccer has gotten too big in the U.S.
Rog and Davo report in from the Crap Part of Rio to mourn England, celebrate the United States, and wonder about small bananas. Rog and Davo talk USA, England, and shed tears for Frank Lampard in Limbo, then complete their Grantland World Cup Previews. Live from Broadway, MiB celebrate US National Teams past and present. Among the epic guests: Lalas, Ley, Meola, Sir Ian Darke, Kyle Beckerman and Judah Friedlander. Rog and Davo discuss Landon Donovan's omission from the U.S. World Cup team and preview a few tournament favorites. Rog and Davo celebrate a rare, happy day for Arsenal. Leyton Orient chairman and pod legend Barry Hearn dispenses wisdom. Rog & Davo present the audio version of the first five Men in Blazers World Cup Previews, covering the mighty Von Trapps, Ingerland, Spain, Argentina, and host nation Brazil. Rog and Davo mourn the passing of David Moyes, "Dare to Jozy," and welcome their hero, Landon Donovan. Rog and Davo revel in the emotional magic of Liverpool-Manchester City. Haim jump on board for the MiB Passover special. Live from Amsterdam's Schiphol Airport, Rog and Davo are stunned by Everton's second wind, Arsenal's impotency, and USA 2-Mexico 2. Rog and Davo walk into a punch they did not see coming as Crystal Palace stun Chelsea to let Liverpool go top. Trail Blazer Nicolas Batum talks PSG. The gents' jaws drop as Chelsea humiliate Arsene Wenger in his thousandth game. Pioneering coach Bob Bradley guests. Rog and Davo marvel at Manchester United's capitulation to Liverpool, salivate over Julian Green, and welcome Tim Cahill to the pod. The gents celebrate Wigan shocking Manchester City again and launch a search for a U.S. World Cup song. Nerdfighter John Green returns to guest. Roger Bennett interviews Jurgen Klinsmann live onstage at SXSW Sports. An Englishman and a German bond over their shared passion for American Soccer. Rog reports from Cyprus to talk about Manchester City's League Cup triumph with Davo, who welcomes Rebecca Lowe back from Sochi. Rog and Davo relive the joy and agony of the John Terry ghost goal that sunk Tim Howard and Everton. The mighty Billy Beane guests. In a live special, Mr. Barry Hearn reveals his "10 Lessons of Life" before a sold-out audience of GFOPs in New York City. Rog and Davo are tongue-tied and cross-eyed by the EPL's narrative flip-flops as Liverpool thrash Arsenal. Marc Gasol guests to preview Barcelona-City. Rog and Davo relive the biblical smiting of Liverpool 4 Everton 0, celebrate Manchester City, and wish guest Rebecca Lowe an Olympic Godspeed.